Customer requirements are met in the latest designs providing heat, light and mood enhancers using modern technology whilst remaining environmentally friendly. 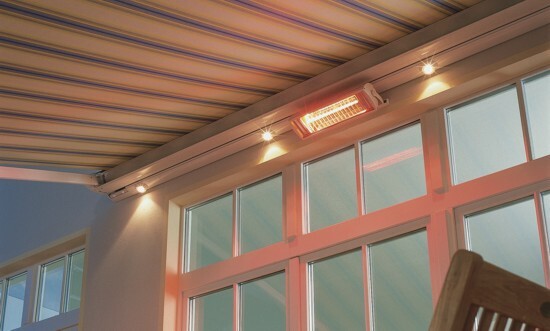 Speak to one of our representatives for further information on these awning lighting and heating systems. Extend the use of your outdoors throughout the year with a clear conscience. 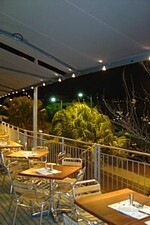 Correctly specified awning lighting also gives a much more pleasant and inviting atmosphere to the designated area to help attract additional custom – especially where your premises is near to passing pedestrians or busy traffic. The running costs of modern quartz infrared halogen heating systems are far lower than any other alternative method, especially gas burning patio heaters. The heat provided is also much more controllable and can be directed onto the area required unaffected by air movement. What is infra red quartz heating? 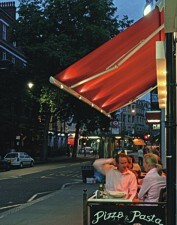 Modern awning and parasol halogen lighting can provide a very pleasant, inviting environment for outside entertainment or dining. The awning lighting and heating can all be controlled by various methods such as remote control handsets, timers and light and temperature sensors. Lighting and heating can also be added to existing parasols and awnings as well as wall mounted and free standing units to be positioned wherever most effective.